Can Gradus stair nosings be used outside? Although the majority of the requests that we receive for stair nosings are for interior use, there are always those circumstances that require an exterior profile. 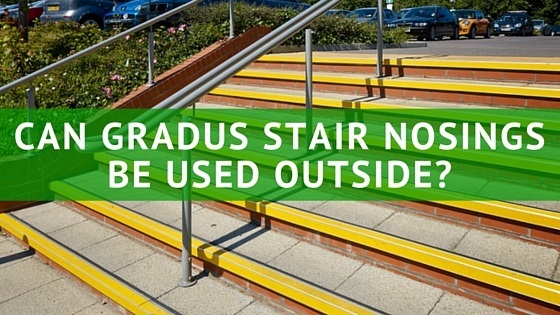 Gradus does have some stair nosings that can be used outside, but only if you use the appropriate insert. What Options Do I Have For Exterior Stair Nosings? There are different types of stair nosings on the market. Some are one piece, solid metal, or plastic stair nosings. These profiles would generally have some type of ribbed finish on the top to assist with slip resistance. One problem with most of these profiles is that they must be installed at the time that the step is formed. They are pre-cast into the step (basically, part of the step). Our Gradus stair nosings can be installed at any time, making them an excellent choice when you’re looking to solve a problem of a deteriorating step edge or a situation that is a slip hazard. All of the Gradus profiles that can be used outside are metal with a specially designed exterior insert on the tread (step) portion of the stair. The insert serves as a slip reducer and can also be used as a visual contrast for the visually impaired.